in one of the project villages. The NLCP Sister School Program was established in 1988 by Delia and Mark Owens to educate Zambian schoolchildren living near the North Luangwa National Park about the need to conserve their natural resources. Delia and Mark discovered that simply fighting ivory poachers wasn't going to be enough. They were going to have to fight ignorance as well. During their first visit to Mukungule Primary School near Mpika, Zambia, Mark and Delia found that most of the children could recognize, from color pictures, only elephants and black rhinoceroses--the very animals most heavily poached in the park. More than 30 elephants were being poached in the park every month, and some of the children's parents were responsible. At that rate the Park would be sterilized by 1996. Something had to be done! Zambia during Zambia Week studies. The NLCP Sister School Program matched American and Zambian students for an exchange of conservation and cultural information. American children, who take electricity and running water for granted, could not conceive of children who had never even seen a color photograph. The Zambian children learned that American children value the African wilderness, and that their wildlife resources in North Luangwa National Park could benefit them through tourism. Although there are many cultural and economic differences between Zambian and American schoolchildren, they soon learned that they shared a love of the natural world. Approximately 50 American schools in 28 states participated in the Sister School Program. Twelve thousand Zambian students benefited from the education programs offered by the NLCP Sister School Program. The program provided supplies such as crayons, paper, and scissors to schools that otherwise receive no such materials. None of the remote rural schools in Zambia have electricity, so the Conservation Education program coordinator, used a generator to show slides or videos. Twice yearly newsletters kept all participants advised of current activities and progress. A Conservation Education Curriculum was developed and provided to each teacher in NLCP target areas. In addition, NLCP (with the great assistance of volunteer, Tom Steeb) developed and produced the "NLCP Teacher's Games and Activities Packet" which included workbooks, conservation topic board games, and an activity book that featured simple activities using items readily available in remote villages. Once a month (weather permitting), the Conservation Education Officer visited every participating Zambian school. 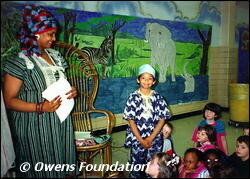 He presented conservation education programs including slide shows, drama, games, and songs. The mobile library was available for all teachers, who otherwise have little or no reading material. 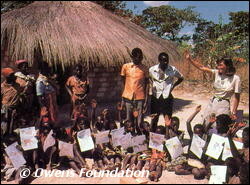 The Owens Foundation also printed, in English, and Bemba, the local tribal language, a conservation coloring book for the Zambian children. Delia and Mark Owens believed that the exchange of ideas and learning materials facilitated by the NLCP Sister School program fostered an awareness and stewardship of nature. It is still possible for interested teachers to participate, in a limited way, in this conservation program. Packets of letters and/or conservation magazines and school supplies can be sent by surface mail to NLCP, Box 450148, Mpika, Zambia. The current staff of the project will distribute the materials to the area schools. It will not be possible, however, for American schools to receive return mailings from the Zambian students, nor will a newsletter be published. U.S.-based teachers should know that any materials that they could send to the Zambian students will be of great value. Letters from the United States are a great motivator and education vehicle. Any teacher interested in participating might find it helpful to introduce their students to the work of Delia and Mark Owens by reading any or all of Cry of the Kalahari, The Eye of the Elephant, or Secrets of the Savanna to them, or having them read it themselves. A video containing National Geographic's "African Odyssey" and People Magazine on TV segments is excellent for classroom viewing. These can be obtained from the Foundation. The Zambian children study English, so letters do not have to be translated. The Zambian school year operates for three months 'in' and one month 'out' year round, beginning in January. Their schools have almost no supplies or visual aides such as maps, books, posters. Many of the children had never seen a picture. Small friendship boxes containing crayons, pencils, and magazines are greatly appreciated. Before entering the program, teachers should know that mailing costs are HIGH, so packages should be designed with size and weight in mind. A USPO airmail shipment to Zambia can take six months to arrive in Mpika. It is ONLY airmail to Lusaka, the capital city of Zambia, where it may wait for months before making the eight hour trip up the Great North Road from Lusaka to Mpika on the Post Bus. An average folder of letters on 8 1/2 X 11" paper from a class of 25 sent via airmail runs $10.00 or so. Friendship packages containing school supplies can be very important to rural schools. If books are donated, remember the USPO'S "M" bag shipping mode (including books, magazines, pamphlets, etc. ), which is cheaper than unrestricted (non book) airmail - but still costly. Check with the post office for restrictions and requirements for: "M" Bag Shipment. Remember if you choose to send an "M" Bag - it requires a sturdy box (with critically important taping instructions below) placed inside a specific "M" Bag with shipping information on a special "M" Bag hang-tag and a customs form. You can obtain the bag, hang-tag and customs form ahead of time from your local post office. You can go to the US Post Office to calculate postage. Or to US Post Office International Shipping for shipping specifically to Zambia to check the potential cost of an "M" Bag or non-book shipment such as crayons, pens, pencils, etc. A ten pound non-book airmail box can range from $35 (flat rate priority package) to $58.00 for non-flat rate parcel (odd size). PACKING SHIPMENTS: Please use a very study cardboard box. Tape with at least two strips of duct tape around each facet of the box. Cover all outside edges of the duct tape with heavy 2 inch clear plastic tape or the duct tape will roll and become sticky and cause a huge problem. However, with the clear tape over it - it makes a nearly waterproof and indestructible box. Thieves do not attempt to tamper with boxes that are taped in this way. Please put the ship to address clearly on the outside of the box and also INSIDE - incase the box is removed from the "M" Bag and or broken open in transit. We have had shipments arrive in Mpika with the books removed from the box and tossed in the "M" Bag. It the address had not been on the box and IN the box, this shipment would surely have been lost. Biographical letters are a good way to start. Attaching small photos to the letters works well. Mentioning wildlife, conservation, local wildlife, and domestic pets is good. Please urge your students not to discuss TV, video, and computer games, and other "first-world" subjects, which the Zambian students might not understand. Writing on one side of a page/sheet and drawing on the other makes an inexpensive, graphic and informative letter. Older students may want to write letter essays describing environmental problems in their community: specific examples of water and air pollution, diminishing wildlife habitat, soil erosion from clear-cutting forests, and how this all affects human as well as wildlife communities in the web of life. Wildlife video and audio cassettes can be forwarded to Hammer Simwinga at P. O. Box 450140, Mpika, Zambia. You could also make a video of your classroom, daily school routine or school play. 2. School Supplies: Paper (lined, plain white or construction--scraps of construction paper left over from your school projects are a wonderful craft material for the Zambian students). These are only a few suggestions. Some donations can be for the school as a whole, such as books, science kits or sports equipment, while others, such as new toothbrushes, should be given to each schoolchild. Supporting the education of the Zambian children is a powerful contribution toward a better world for all of us--including the elephants. Thank you for your caring and commitment.